The NASA spacecraft that yielded the first close-up views of Pluto opened the new year at an even more distant world, a billion miles beyond. LAUREL, Md. (AP) — NASA’s New Horizons spacecraft pulled off the most distant exploration of another world Tuesday, skimming past a tiny, icy object 4 billion miles from Earth that looks to be shaped like a bowling pin. Flight controllers in Maryland declared success 10 hours after the high-risk, middle-of-the-night encounter at the mysterious body known as Ultima Thule on the frozen fringes of our solar system, an astounding 1 billion miles (1.6 billion kilometers) beyond Pluto. The close approach came a half-hour into the new year, and 3 ½ years after New Horizons’ unprecedented swing past Pluto. For Ultima Thule — which wasn’t even known when New Horizons departed Earth in 2006 — the endeavor was more difficult. The spacecraft zoomed within 2,200 miles (3,500 kilometers) of it, more than three times closer than the Pluto flyby. Operating on autopilot, New Horizons was out of radio contact with controllers at Johns Hopkins University’s Applied Physics Laboratory from late Monday afternoon until late Tuesday morning. Scientists wanted the spacecraft staring down Ultima Thule and collecting data, not turning toward Earth to phone home. Cheers erupted in the control center and in a nearby auditorium, where hundreds more — still weary from the double countdowns on New Year’s Eve — gathered to await word. 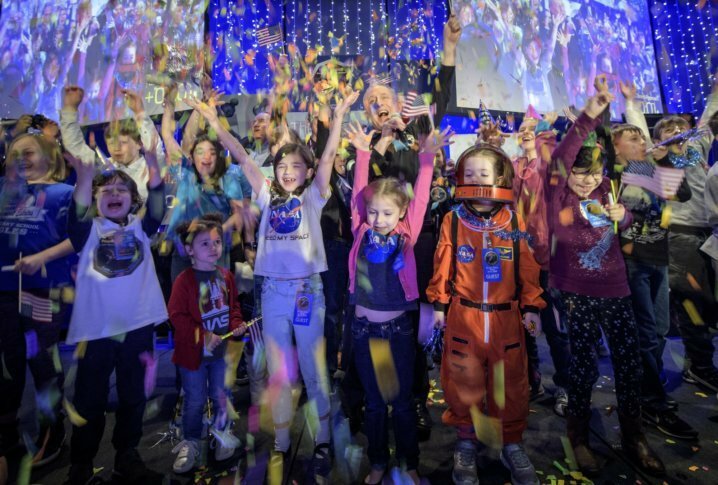 Scientists and other team members embraced and shared high-fives, while the spillover auditorium crowd gave a standing ovation. Stern, Bowman and other key players soon joined their friends in the auditorium, where the celebration continued and a news conference took place. The speakers took delight in showing off the latest picture of Ultima Thule , taken just several hundred-thousand miles (1 million kilometers) before the 12:33 a.m. close approach. “Ultima Thule is finally revealing its secrets to us,” said project scientist Hal Weaver of Johns Hopkins. Based on the early, rudimentary images, Ultima Thule is highly elongated — about 20 miles by 10 miles (32 kilometers by 16 kilometers). It’s also spinning end over end, although scientists don’t yet know how fast. As for its shape, scientists say there are two possibilities. Ultima Thule is either one object with two connected lobes, sort of like a spinning bowling pin or peanut still in the shell, or two objects orbiting surprisingly close to one another. A single body is more likely, they noted. An answer should be forthcoming Wednesday, once better, closer pictures arrive. By week’s end, “Ultima Thule is going to be a completely different world, compared to what we’re seeing now,” Weaver noted. Still, the best color close-ups won’t be available until February. Those images should reveal whether Ultima Thule has any rings or moons, or craters on its dark, reddish surface. Altogether, it will take nearly two years for all of New Horizons’ data to reach Earth. The observations should help scientists ascertain how deep-freeze objects like Ultima Thule formed, along with the rest of the solar system, 4.5 billion years ago. As a preserved relic from that original time, Ultima Thule also promises to shed light on the so-called Kuiper Belt, or Twilight Zone, in which hundreds of thousands of objects reside well beyond Neptune. “This mission’s always been about delayed gratification,” Stern reminded reporters. He noted it took 12 years to sell the project, five years to build it and nine years to reach the first target, Pluto. Its mission now totaling $800 million, the baby grand piano-sized New Horizons will keep hurtling toward the edge of the solar system, observing Kuiper Belt Objects, or KBOs, from afar, and taking cosmic particle measurements. Although NASA’s Voyagers crossed the Kuiper Belt on their way to true interstellar space, their 1970s-era instruments were not nearly as sophisticated as those on New Horizons, Weaver noted, and the twin spacecraft did not pass near any objects known at the time. The New Horizons team is already pushing for another flyby in the 2020s, while the nuclear power and other spacecraft systems are still good.